Hi, I'm Nicola Currie and I am one of the wardrobe assistants on Summer Festival. So, we're halfway through week 4 and here in the Wardrobe Department, we've finished sourcing, making and altering most of the costumes for the casts for all 3 shows. Although I have been working primarily on Prom Night, here in Wardrobe we muck in and help out on all of the shows when we can. For this year's shows, the majority of costumes to make were for Prom Night so it's been like a 50s B movie in our wee room for the last few weeks! Because we have now started to place all the costumes in the changing rooms ready for the dress rehearsals and techs, we are at a great stage where we can source all the nice parts of dressing that makes costumes come together, for example shoes, bangles, earrings, gloves, glasses, caps, etc. With what feels like hundreds of young people to dress, where possible we "make do and mend". Yesterday, we spent the morning painting PVA glue on four pairs of £6 VERY high heel shoes and covering them with bright blue glitter, they now look a million dollars! I wonder whose costume they could be......!!!! 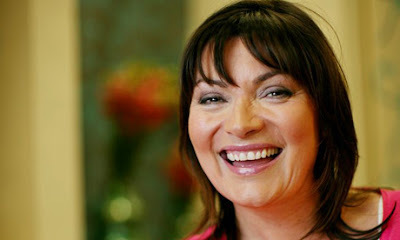 The person I would like to play me in the movie of my life would be Lorraine Kelly. Right, we're off to pick up some last minute items in the sales, see you for opening night! SF 11 Week 2 ... is over! Already? !